Anne of Green Gables is a worldwide phenomenon that has sold over fifty million copies and inspired numerous films, plays, musicals, and television series. It has turned Prince Edward Island into a multimillion-dollar tourist destination visited by hundreds of thousands of people each year. 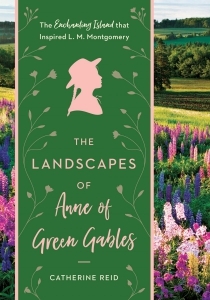 In The Landscapes of Anne of Green Gables, Catherine Reid reveals how Lucy Maud Montgomery’s deep connection to the landscape inspired her to write Anne of Green Gables. From the Lake of Shining Waters and the Haunted Wood to Lover’s Lane, readers will be immersed in the real places immortalised in the novel. Using Montgomery’s journals, archives, and scrapbooks, Reid explores the many similarities between Montgomery and her unforgettable heroine, Anne Shirley. The lush package includes Montgomery’s hand-colorised photographs, the illustrations originally used in Anne of Green Gables, and contemporary and historical photography. Discover the extraordinary landscapes of Anne of Green Gables.